Updated 6th February 2014 with photos of the completed puzzle, see bottom! I have many fond memories of doing jigsaws. When I was little we always seemed to have one on the go, and at Christmas time we always worked through our jigsaw collection. 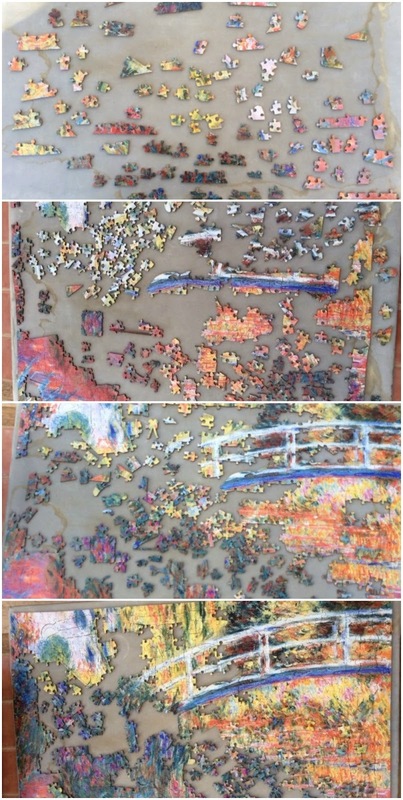 The last few years have seen less of an indulgence in my hobby, but as I blogged recently, now that the children are bigger and I can trust leaving out partially completed puzzles, it's a pastime that I'm hoping to rediscover. Wentworth Wooden Puzzles recently contacted me to ask if I would like to review one of their puzzles. Of course I said yes, and immediately went over to the website for a browse. I quickly realised that these were very special puzzles. The Wentworth Wooden Puzzle Company has been producing wooden jigsaws since 1994, and the high quality jigsaw puzzles are beautifully cut and completely unique. 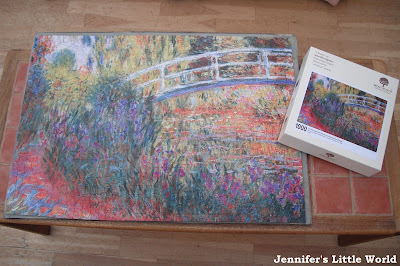 I chose a puzzle design based on a painting by Monet - Le Pont Japonais from the Fine Art collection. It's a lovely painting with lots of gorgeous colours. I wanted a bit of a challenge, so I chose a cut with 1000 pieces. The puzzle arrived beautifully packaged in a smart drawstring bag inside a sturdy box. I started the jigsaw where I always do - with the edges. It quickly became apparent that I was in for a challenge. Some of the edge pieces didn't look like edge pieces, and some of the non edge pieces did! Even the corner pieces were not always easy to find because of the way that the jigsaw has been cut. Every piece in the jigsaw has a completely different shape, and the pieces also vary in size. The jigsaw cut is full of the trademark Wentworth 'whimsy' pieces. These are jigsaw pieces which are cut into special, unique shapes, usually to reflect the theme of the jigsaw. I was a bit worried when I first saw them, especially the tiny paintbrushes, as I thought they looked so flimsy, but as soon as I picked one up I realised that because the wooden backing is so thick they are actually very sturdy. The whimsy pieces in this puzzle are all appropriately themed around art and painting. I know that this puzzle from Wentworth is going to be a pleasure to complete. The pieces slot together beautifully and are lovely to handle. The entire jigsaw is going to take me a good while to complete, and so I will be updating this post with a photograph when it is finished! Prices for a Wentworth Wooden Puzzle start at around £24.95, although the price depends on how many pieces you choose in your cut. The jigsaw that I received with 1000 pieces costs £99.95. This is expensive, but it's important to remember that this puzzle is a very high quality item. It's worth watching the short video which I've embedded below, which gives an idea of the fascinating process that goes into creating each puzzle. 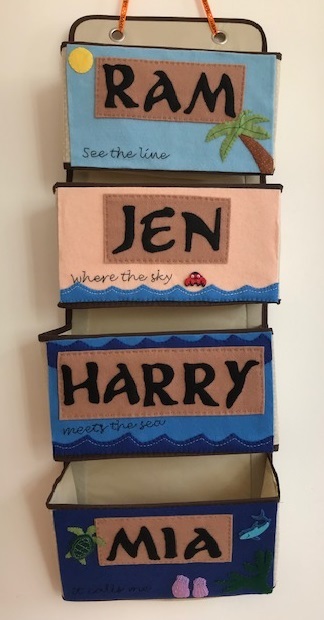 Wentworths have a wonderful range of jigsaws, including some gorgeous children's jigsaws which would make a lovely, sturdy keepsake gift for a new arrival, or a special Birthday or Christmas present. 6th February 2014 - UPDATE! As promised, I have returned with an update now that the puzzle is complete!
" What a wonderful jigsaw. Must be the best one I have ever done, for the quality, enjoyment value and challenge. It is cut from wooden pieces, with many unusual shapes, so the pieces fit together beautifully and cleanly, but it takes a lot of thought. It took me about a month to complete, and several times I got stuck, so it took some perseverance. Definitely one for the jigsaw connoisseur, and I can see this one coming out again, and being kept as a family heirloom. Would love to try another one! Of course it is pricy but worth it for the quality. Wonderful as a special present." My Mum has a lot of experience with jigsaws, so such high praise does indeed mean that this jigsaw was something special. She kept me updated with her progress, and so here's a little collage showing her progress as she completed it. I received the jigsaw for the purpose of this review, but all words are my own. It's definitely something that I'd think about asking for a gift for myself, it's definitely going to take me a long time to complete, and I like long term projects! What a wonderful jigsaw! Looks like it will provide many hours of jigsawing to complete, and definitely an heirloom item to keep.